It looks like a Golf, but runs like a Fabia. The luggage compartment is nearly as big as a station wagon. Could it be the ultimate family compact? The Spaceback looks good. It shares identity with “family members” like the new Golf, the Audi A3 Sportback and the facelifted Seat Leon. Alloy wheels and fog lights look nice. But a beautiful appearance cannot hide the dull interior of the basic equipment line. Plenty of plastic – cheap plastic. The only positive feeling you get when you enter the car, is a feeling of space. Plenty of space. This is a typical car for everyday transportation of kids, football-players and muddy dogs. As I take the car on the road, I understand at once that this is neither a Golf, A3, nor Leon. This car drives like a Fabia. A large Fabia. I checked on the Internet to find out that the Skoda Rapid is built on the front suspension of the Fabia, and has borrowed the Roomster’s rear axle. It’s not a bad car to drive, but does not live up to the Golf we tested a few weeks ago. 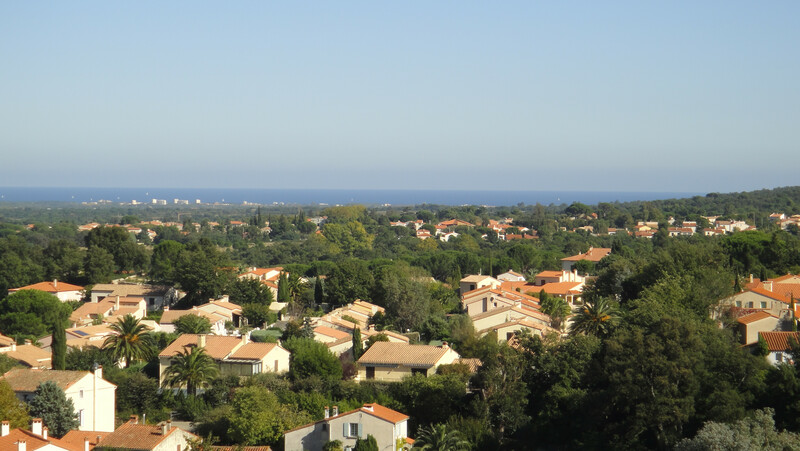 We used the Rapid in connection with a relocation process, moving bits and pieces from an apartment to a small village house in the south of France, – close to the Spanish border. We drove a lot, both empty and loaded with furniture and household items. The Rapid has plenty of room. I felt it was more like a small “van” than a driving machine. Extra weight affects the performance in the same manner as it would in the smaller Fabia. One thing I really hated, was the location of the clutch pedal. It was located too far to the right. I got the feeling of sitting diagonally when I used the clutch. The pedal rubber was heavily worn on one side, despite the fact that the car was quite new. A sign that other drivers must have felt the same. The well-known TDI engine of 105 horsepower worked well. The 5-step manual transmission distributed the power as it should, and I did not feel any necessity for more gears. I never managed to adjust the driver’s seat correctly. The height adjustment lever affects the rear end of the seat cushion, only. In order to get some lateral support, I had to jack the seat all the way down. But then I felt I sat too low (I’m 1.88 tall). Therefore, I had to seek a compromise. 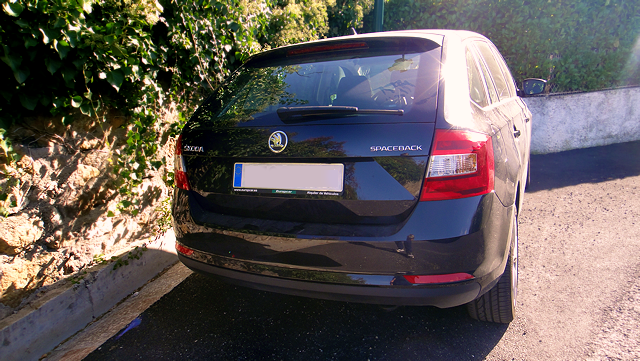 Apparently, Skoda has chosen to use standard Fabia seats, which do not fit this vehicle very well. If the seats had been placed a few centimeters higher, they would fit me much better. Another weakness of comfort is the relatively high noise level, especially from the TDI engine at slow speed. Since the engine worked well at low revs, it did not feel annoying. At motorway speed the noise did not seem that intrusive. I liked the leather steering wheel, the front armrest and the manual air conditioning worked fine, too. The Spaceback has 415 liters of luggage capacity. With the back seats folded down, it is possible to carry 1370 liters. The Golf’s luggage capacities are respectively 380 and 1270 liters. In the Spaceback the trunk seems considerably larger and deeper than the Golf. Even inside does the Spaceback feel more spacious than the Golf, but I think that can be explained by the fact that the Skoda is equipped with rather small and low seats. If I was a salesman at Skoda, I would use “space” as the number one selling point. 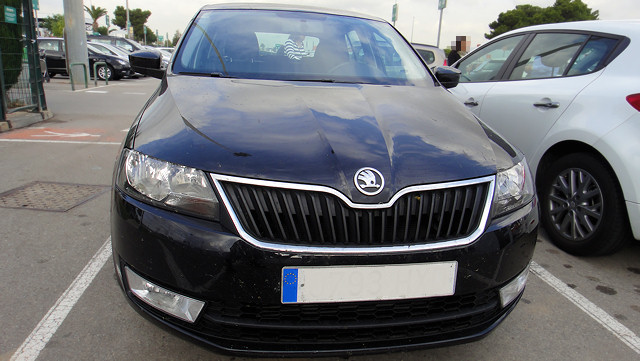 Skoda Rapid is one of the latest models from Skoda. Basically, it has almost the exact same level of security as Octavia – according to NCAP. But you cannot order it with the latest and most advanced safety equipment like BLIS (Blind Spot Info System) alerts, drowsiness detection system, lane change alerts and adaptive cruise control. Besides, do not expect the active safety to be at the same level as Golf. Braking distances, for example, are considerably higher in the Spaceback. The TDI engine with 105 horses is one of the market’s best engines when it comes to fuel consumption and economy. It is easy to find an economical driving style. A low price tag and an expected good resale value also contribute to a positive and healthy economy. It seems that Rapid is designed to fill the demand for cheap cars in Eastern Europe and countries in the Near East. Its main contestants are other typical cheap cars, such as Dacia and the Korean brands. In countries where there are high import taxes on cars, the price advantage gets less significant, and you might as well buy an Octavia or a Golf. The Rapid is not the ultimate family compact, but it did a respectful job as a removal van. • Hard to find comfortable seating position. • The clutch pedal is too far to the right.